On board a no. 38, Shaftesbury Avenue, 2005. Photo © Tim Marshall. Everybody maps the city in his or her own unique way. My map of London started in 1980 when, as a student, I travelled from Battersea to Leicester Square on the old Number 19 Routemaster, as I made my way to the CSM Graphic Design building in Covent Garden. The characters I encountered on the journey intrigued me and I began making drawings of my fellow passengers. My location eventually changed and I went underground to become a Northern liner for two years, then in 1986 a Piccadilly Line man. 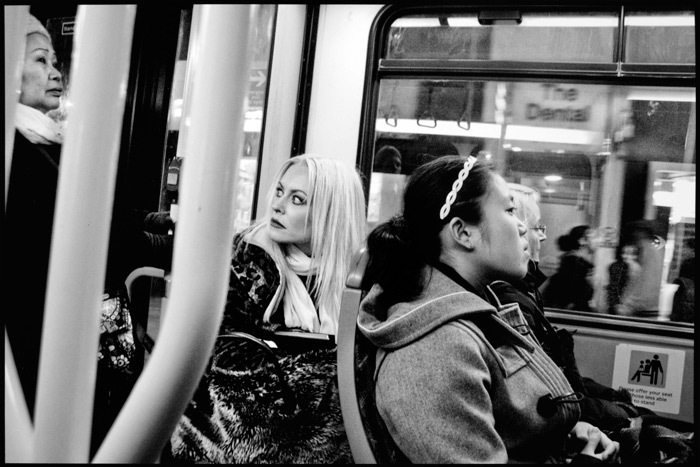 The tube became another project, this time photographic, and I rarely travelled by bus anywhere during that time. On moving to Islington in 2004, the estate agent said “ It’s a great location, only five minutes from Angel.” At the time good public transport connections all seemed terribly important. In my new locality I was pleasantly surprised to see the old Routemaster bus was still running, conjuring up every good thing about London, like a giant dinky toy from my childhood. Everyone appeared happy on the ‘Cliff Richard’ bus. You invariably knew the bus conductor, who would chat and make jokes, and you didn’t have to worry about bus stops, you could just jump off where and when you wanted to (all at your own risk, of course). Then one day, like Triffids in the night, the dreaded ‘Bendy Bus’ appeared.